THOUSAND OAKS, Calif. — The Los Angeles Rams had just won decisively, beating the division-rival Arizona Cardinals, 33-0 to head into their bye week with a 5-2 record. But one aspect continued to gnaw at first-year head coach Sean McVay: His premature use of timeouts. McVay has burned 73.1 percent of his timeouts outside the final two minutes of either half, a time when coaches often need to conserve clock. It’s the highest percentage in the NFL, according to research from ESPN’s analytics department. 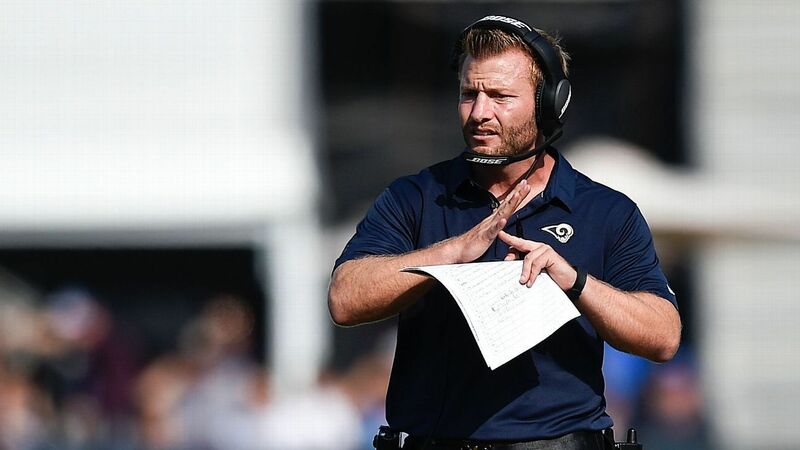 In the most recent win, McVay used all three of his first-half timeouts with more than 12 minutes remaining, which kept him from challenging a call that could have been reversed. Rams special-teams coordinator John Fassel, who served as the team’s interim head coach in the final three games last season, will tell you that McVay is simply using his timeouts when he needs them, which is really the point. Most of the time, Fassel added, the timeouts have been utilized to get the Rams out of what would’ve been a bad play. It drew a laugh, but he wasn’t joking.